Depending on which time zone you’re in, either yesterday evening or early this morning, a rocket-powered sky crane lowered the Curiosity rover gently to the surface of Mars, just in time for Curiosity to send a few low-res images before the Mars Reconnaissance Orbiter (MRO) and Odyssey, either of which could relay its signal back to Earth, dropped below the horizon and lost contact, culminating years of planning and months of anxious anticipation. 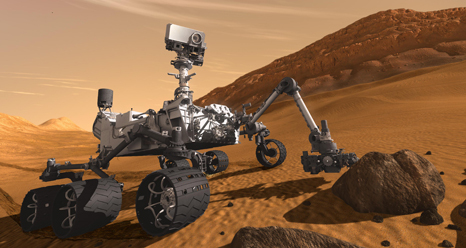 Considering the complex sequence of steps involved, the narrow window of time within which each had to be performed, and the fact that all were performed autonomously by the system in flight or by the rover itself, this successful landing is a major victory for the incorporation of robotic technologies into rocket science. Congratulations to all involved!